During the worst economic recession in decades, the simple act of putting food on the table can be difficult for working class families, not to mention those near or below the poverty line. When parents are desperate to get their children fed, they don’t always have the luxury of worrying about whether their kids are getting the daily nutrition they need for real health. Sometimes, just providing a kid with calories is all one can do.. Combine the jobless rate and house foreclosures with rising gas prices and awful weather patterns, and you don’t need an online PhD to realize you have a recipe for disaster. These factors have contributed to rapidly increasing food prices. This is especially true in the produce section, where the cost of growing crops and transporting harvests can make fresh produce a lot more expensive than processed foods. Buying healthy foods can certainly hurt the grocery budget. However, few people ever stop to think just how expensive eating the cheaper and less healthy foods can be in the long run. McDonald’s dollar menu might not seem like such a good deal when you realize it can result in massive healthcare bills. A study conducted by Andrew McDermott and published in the Family Medicine Journal found the overall cost of fast food was actually greater than that of healthy foods bought in supermarkets. In fact, the cost per calorie of a diet based on fast food was 24 percent higher than that of homemade diet of healthy food. Costs were calculated at three urban grocery stores, showing that it is possible for families to eat healthy for less, even when living in an urban setting. Because not all foods are affordable, the study looked primarily at the lower-cost foods found in supermarkets. These spanned all of the food groups and included bananas, apples, frozen spinach, frozen peas, skim milk, chicken breasts, beans, cornflakes, and more. The cost of diets based on fast food was calculated using the breakfast, lunch, and dinner meals at a large fast food chain. The fast food diet included fries, burgers, soft drinks, and chicken nuggets. The study proved that in the short term, it’s more than possible to eat healthy without spending a lot of money. In fact, the participants eating at fast food restaurants actually spent a lot more money than those buying groceries. However, the study didn’t show the high cost of healthcare commonly paid by those who eat fast food on a frequent basis. When this factor is added in, savings for people eating grocery store food skyrocket. 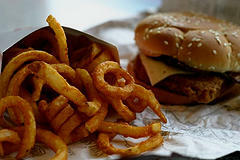 New York Times columnist Mark Bittman says the true cost of eating fast food is typically underestimated. Frequent consumption of junk food can take a serious toll on physical and mental health. In his column, Bittman cites a 2009 study by the Scripps Research Institute in which fast food was proven to trigger “addiction-like neuroaddictive responses.” Even if they consciously know other food is less expensive, frequent consumers of fast food will have a hard time switching over because they are literally addicted. Just as the long-term consequences of of cigarette use are devastating, so are the long-term costs of eating a convenience diet. People eating at fast food establishments are at greater risk for obesity, diabetes, heart disease, and a whole host of other conditions. These problems can be devastating to one’s health and are very expensive to treat. Once the cost of health care is added into the mix, fast food quickly becomes the more expensive option.